Have you ever had someone tell you to hit or spank your child? The other day I was talking to an older woman and she was telling me about her granddaughter. Apparently, she is giving her parents some problems around curfews and house rules. I am one of those people who talk to strangers in the gym about their lives. Anyway, I explained that my seven-year-old has been a little sassy lately. We have been dealing with some argumentative and oppositional behavior related to both his Autism spectrum diagnosis and his ADHD. 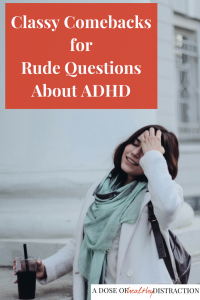 I hear rude comments about ADHD nearly every day. Now that I think about it the questions are pretty rude as well. There is so much misinformation and misunderstanding out there. Perhaps it would be helpful to have some well-thought-out responses in our back pocket? Comeback: It’s not so much a disease as a difference in cognition. The way we absorb information and learn is a little different. And no, you cannot catch it like a virus. Comeback: Were you spanked/beaten as a child? There is a lot of medical research that says physical punishment doesn’t work. Or better yet, Can I practice on you? Comeback: Hmmmm do you think depression is real? If depression is caused by a problem with neurochemicals, is that real? Comeback: An excuse for what? I wish it was. I wish I could turn it off, but it’s how my brain works. Or better yet, What’s your excuse? Comeback: No. You’re right, medication doesn’t fix ADHD. But are your eyeglasses/contacts a crutch? What would happen if you didn’t use them? Comeback: Perhaps. But meltdowns like this happen with ADHD children when they cannot organize and express their thoughts appropriately. Comeback: ADHD is not a character flaw. It’s a different in brain structure and chemistry and it is not a choice. And I’m not feeling motivated to discuss this with you. Comeback: Sometimes we say and do things impulsively. We having trouble pausing before we act. And no, we don’t enjoy negative attention. Comeback: Yes, hyperactivity can be exacerbated by too much sugar. But the physical manifestation of hyperactivity would be present even if we ate no sugar at all. Comeback: I have read all of the parenting books. ADHD cannot be “fixed” by trying different parenting strategies. You need more comprehensive treatment. Comeback: Does your kid have ADHD? I’m guessing not. Comeback: I never outgrew it. Only about 30% of people do outgrow it. Comeback: Sure. But I’m more afraid of what will happen if I don’t treat it. Statistically he is at higher risk of delinquency and drug abuse if I don’t treat ADHD. Many adults with ADHD self-medicate with much more dangerous drugs. Comeback: Nope. It’s not about being forgetful or distracted. It’s a long-term, ongoing pattern of symptoms that impact your quality of life. You having an off day is not the same thing. Comeback: You’re such a nice person. How could you be so closed minded? People with ADHD are not dumb. They have a neurochemical difference in their brains. The reason I don’t seem ADHD is because I have treated the condition. Please feel free to add your own examples and classy comebacks in the comments below! I now offer personalized one-on-one ADHD support! For more info GO HERE. Or just join my semi-regular email list. I don’t send junk.